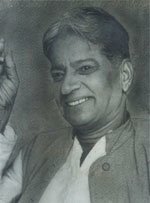 Rayasam Bheemasena Rao (1913-1980), popularly called BeeChi, was one of most prominent personalities in writing in Karnataka. He was often termed as the GB Shaw of Kannada literature. He wrote under the pen name BeeChi (which is also the name he preferred to go by in his daily life) and is best remembered for his mastery of the genre of humour. He was a prominent member of the Kannada literary society and has been both an inspiration and an influence for the generations that followed. BeeChi was born in Harapanahalli in the Bellary district of Karnataka, India, in the year 1913. He enjoyed a relatively normal childhood and studied till he obtained his Secondary School Leaving Certificate (SSLC) after which he discontinued his studies and went to work in the government office as an attender. Before eventually finding his roots as a writer, he worked for the Crime Investigation Department (CID) for a long period of time. There was nothing too significant about BeeChi’s early life and it was very ordinary and uninspired until, while on a long train journey, BeeChi was drawn towards Kannada literature after reading a novel titled Sandyaragaby by A.N Krishna Rao. This novel moved him so much that he decided that writing was where his heart lay. He regarded Krishna Rao as his greatest influence and drew his motivation and inspiration to write from him. BeeChi’s novels are extremely popular and they can be considered masterpieces in their own genres. He is credited with having written sixty books over the course of his life and though he can be regarded as a master of the genre of humour, he did not limit himself to only writing humour based novels. Instead, he expanded his repertoire to include dramas and various articles. His first novel (titled Dasakoota) was published in 1945 when he was thirty-two years of age and was a revolutionary book that brought him much fame and introduced him to the world as an innovative, fresh and bold writer who was not afraid to tread on his toes and skirt around sensitive issues. BeeChi always found a way to make people laugh at social issues while learning to appreciate their seriousness. His greatest contribution to the world of Kannada literature was the character Thimma. His novels are popular till date as they are must read pieces for any person who’s fond of Kannada literature. BeeChi breathed his last in the year 1980 at the age of sixty seven. He will forever be remembered as a figurehead of Kannada literature and was even honoured by the Indian Postal Service, which released a special and rare postal envelope in honour of the great writer. His innovation, his unorthodox outlook and his refusal to conform to the limitations of social correctness are the key factors that made him stand apart as an icon.